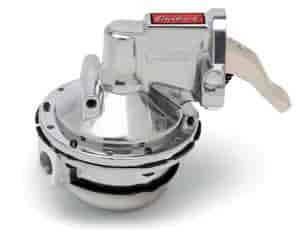 Edelbrock's Victor series fuel pumps are great for drag racing, circle track racing and street machines. The Victor series pumps are designed for high-volume fuel flow, they feature 3/8" NPT inlet/outlet ports and have a flow rate of 130 GPH at 10psi. These pumps feature a high quality 3-stage polished finish. The lower housings are clockable and can be rotated in 60° increments for the best inlet/outlet alignment. Victor Series pumps require the use of an external fuel pressure regulator and are for Gasoline Applications ONLY. Victor Series pumps are not compatible with Edelbrock feed plate Part #350-1798. Does Edelbrock 1712 fit your vehicle? JEGS 15998 - Universal Fuel Hose 3/8 in. I.D. x 25 ft.
JEGS 15997 - Universal Fuel Hose 3/8 in. I.D. x 10 ft.